New from Vignette -- California Brut! A blend of California Muscat and Chardonnay juices. Lightly sweet, delicately fruity, and delightfully effervescent. Available in a 750 ml bottle. 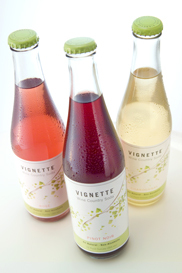 For a list of restaurants and stores that carry these sodas, check the “contact” section of the Vignette website. Photos by Matthew Carden, photographer, and Jennifer Carden, food stylist. Having a baby changes a life, not always in predictable ways. 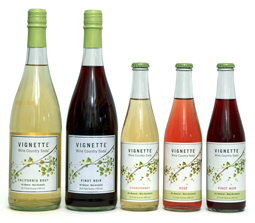 The birth of his first child was one of the factors that launched Pat Galvin into a new enterprise, Vignette Wine Country Soda. Pat grew up in Rhode Island as the oldest of 6 boys. “We spent some time in the San Diego area when I was little, and that memory stayed with me. It just took me until 2000 to get back here!” Pat says with a smile. After graduating, Pat managed the election campaign for a Rhode Island Congressman. “It was my first marketing job,” he says. “I loved it. “ However, he found that working on Capitol Hill in Washington DC didn’t hold the same appeal, so when the Pat and his wife Sharon had the opportunity to move to Chicago, he went into advertising and new product development. “The part I enjoyed the most was the communication challenge,” he remembers. The next step was business school at University of California - Berkeley and a job at Levi Strauss in marketing management. Then a baby. Pat took his inspiration from the wine country. He saw the same beautiful quality in the Northern California countryside that he had loved in France. He researched the idea of using California varietal wine grapes as the natural sweetener for a soft drink that would appeal to the adult palate.